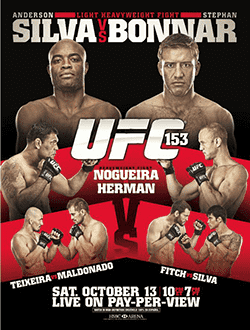 After making a tidy profit in our last round of UFC picks, we move on to UFC 153 in Brazil. Yet another card which has been plagued by injury. At one point an injury improved the situation, Frankie Edgar stepping in to face Jose Aldo – a fight everyone has been asking for, but again we were left disappointed when Aldo was forced to pull out. To save the day, Anderson Silva offered to take a main event fight, at 205 lbs due to the short notice. And Stephen Bonnar offered to step into the opposite corner. A fight that nobody particularly asked for, but I think both men, especially Bonnar deserve some credit for stepping up. What is there left to say about Anderson Silva. He’s knocked out middleweight contender after middleweight contender, with the most dynamic striking displays ever seen. And the few that managed to take it to the ground in an effort to negate his striking, met an end at the hands of his submissions. He’s undoubtedly the best fighter of all time. Undefeated in the UFC, and extending multiple records each time he steps into the octagon. Facing him, with little regard for his own personal safety is Stephen Bonnar. Bonnar’s crowning moment in the octagon was the original Ultimate fighter finale verses Forrest Griffin, one fight that played a big role in saving the sport of MMA. Bonnar has never been stopped in a fight, his 2 TKO losses were down to Doctor’s stoppage due to a cut. I don’t think he has anything he could pull off that would give him a win. The only question for me is whether Anderson will knock him out or if Bonnar will survive 3 rounds of war to emerge with a bloody smile. The bookies have Anderson so short that I don’t think there is value in betting either of them. My only bet in this fight is for it to go the distance, +300 at US friendly www.betonline.com and 3/1 with www.bet365.com and others. It’s only 3 rounds due to being short notice, a fact that some bookies may be overlooking. Nogueira has taken a huge a amount of punishment in his career. Between his Pride and UFC careers he has fought everyone, is it finaly starting to take its toll? A brutal kimura at the hands of Frank Mir had him sidelined for almost a year. Realistically we’ve no way to know how his rehab went. Dave Herman started out his MMA career with an undefeated run of 15 fights and entered the UFC with a 20-2 record. But the UFC is so far ahead of the regional shows that he was soon out of his depth. Back to back losses mean at present, he is simply filling a spot on the roster. Nogueira should win, he is the more experienced fighter, and in my opinion the better fighter. However I’m not going to bet on this one. The uncertainty around Nogueira after the injury, and the fact that Herman is possibly fighting for his contract means an upset is not unlikely. While we’re not betting on this ourselves, if we chose to do so, we’d lean towards Nogueira by submission. Glover Teixeira is a rising star in the 205 division. BJJ blackbelt with a confidant stand up game. I was looking forward to seeing him face Rampage, his original opponent. Maldonado is currently riding out two losses, but both were close decisions and he fought well. I think he is out matched here. But will probably get another final chance to prove himself. Wagner Prado gets a rematch after an accidental eye poke. This is great for him as he genuinely looked devastated when the doctor ended the last fight early, but he is still miles out of his depth with Phil Davis. Realistically not a whole lot has changed since August, yet the bookies line has drastically changed. In August Davis was 1/6 odds, now 7 weeks later, he is almost 1/3. So for the same outlay, potential profit has almost doubled. The bookies have realized that maybe 1/6 was too short leaving value in a Bet on Prado, but the knee jerk reaction has seen them come two far back on the other side. Davis represents clear value for me. Jon Fitch was once considered the second best welterweight in the world. A 16 fight win streak ended only by GSP. His only loss in over 20 fights. But lately it hasn’t gone so well, a boring draw with BJ was followed by a quick knock out at the hands of Johnny Hendricks. In contrast to Fitch, Erick Silva has been an exciting introduction to the 170 division. His only recent loss was a harsh DQ for striking the back of the head. Based on recent form, and the fact that he has home advantage, the bookies have made Silva a slight favorite. However, I disagree. Fitch is still a top WW. BJ is a legend and fought hard for the draw. And a flash knockout can happen to anyone. It’ll be tough, but I think Fitch grinds out a decision win. Damien Maia is an excellent fighter. However, he is very inconsistent. For years he got by simply by being one of the best grapplers in the game. In an effort to grow as a fighter he tried to develop a stand up game, which is fine, but he almost neglected opportunities to end fights. I’m hoping that being back in Brazil will see Maia showcase his BJJ game. Rick Story is a high level fighter, but I feel his chances of success depend much more on which Maia shows up on Saturday. I’m hoping Maia gets back to his best and i’ll be backing a win by sub. The undercard is mostly little known fighters, but one bet that I like here is Diego Brandao. The ultimate fighter winner suffered a loss in his first fight after the finale. The UFC will probably want to see him win so they can promote him a bit more, and he’ll hopefully have a year of solid training behind him now.